Off grid yurt on 45 private acres amid White Mountain N.F. Secluded off-grid home perfect for reconnecting with the natural world. Handcrafted from local wood, the yurt has a spacious interior with high ceilings, a wood burning stove, games for evenings in, and access to beautiful trails for days out. Hike, bike, snowmobile or ski from the door to waterfalls, ponds, or just around the property in search of birds and wildlife. Fly fish up at Province or Mountain Pond for the day. 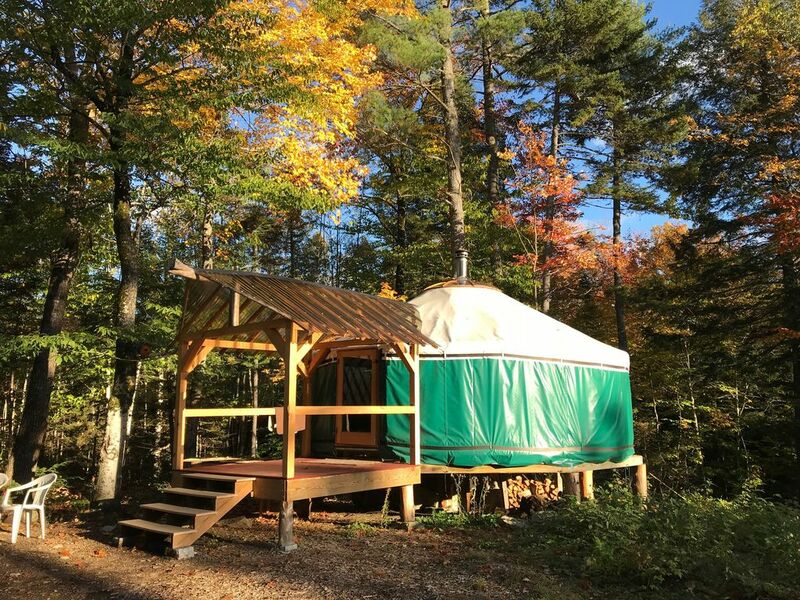 The yurt is situated on 45 acres in Evan's Notch and sits close to Langdon Brook. It is completely surrounded my National Forest and has access to snowshoe and hiking trails, as well as snowmobiling corridor 19. There is both a fire pit and gas grill, but *NO* running water (other than the brook) and has *NO* electricity (other than solar lights that are provided). It is a gorgeous retreat all times of year, but definitely a spot for those used to roughing it, despite the yurt's cozy interior. The outhouse, grill and fire pit are all located adjacent to the yurt. PLEASE MAKE SURE YOUR FOOD IS ALWAYS SECURED FROM WILDLIFE. The property is off grid and NOT plowed in winter. You will need to access it by foot and use the written directions once booked. Guests have full access to the Yurt, Toad Hill's 45 acre property and multiple hiking trails as well as Langdon Brook's waterfalls, Province Pond, and Mountain Pond, where you can swim or fish. The property is surrounded by hundreds of acres of national forest which makes it an ideal location to enjoy nature and hike. It is also right on corridor 19 snowmobiling trail, making it a perfect destination for a cozy winter night. I am available to my guests by phone if I'm not there in person. Service is not great on the property, so please make sure most of your questions are answered before heading up to the land. Don't hesitate to contact me with any questions or concerns. I enjoy interacting with my guests. ~The space is usually accessible by car from May to December. ~In the winter it is a short snowshoe to the property, less than one mile. The trail is often packed down, making access a bit easier. ~Please pack in and pack out all trash and recycling. Leave no trace ethics. You are welcome to pee in the woods, please do not leave toilet paper. ~I sell firewood on site and ask that guests not bring in outside wood to control bugs and other diseases. ~Outdoor fires must be attended at all times per fire department. ~If you beep upon arrival I can come and find you if I'm around. ~I have sheet and towels available for a cleaning fee. ~Please take trash with you and leave no toilet paper in the woods. ~No shoes allowed past the entryway mat. ~This is a beautiful rural location yet only 5 minute car ride to a deli and Stow Store. Lovell store just 15min away. ~Composting toilet is located behind the shed. ~The wood stove will heat up the space a lot, don't put too much wood in, and please NO CANDLES, especially on wood stove. ~Outside fires in the designated area must be put out and watched after. We enjoy hosting and meeting new people at Toad Hill! Justin creates wood and stone sculptures on the property, hosts a music festival every summer, is a semi-professional photographer, and a professional saxophonist. Sara owns a fly fishing shop, holds a Master of Science in Natural Science Education, is trained in survival skills, tracking, natural interpretation, and Montessori, and holds a B.A. in Theater and Art. We were both teachers for many years, Justin in Spain, teaching English and in the US, teaching Spanish, and Sara as the Director of Environmental Education and a Lead Montessori Instructor, and Lead Wilderness Instructor. This is a very unique space surrounded by forest. Few places exist like this on the East Coast. We had a lot of fun staying at this place. In a beautiful spot, very tranquil. Cozy once the cast iron stove is warmed up, even on a cold night. If you stay in winter, I suggest arriving before dark and having good boots for the 30 min walk to the Yurt. 1. THIS IS NOT A “WATERFRONT” PROPERTY. We specifically sought a waterfront property. The yurt is listed as such and mentions a stream nearby. The “nearby” waterhole is, in fact, a 20 minute walk. It is pretty, but it’s not close. 2. Remove the junk from around the area. The NH-ME border is beautiful and the spot is remote. The big trailer and the gas tank stored right by the yurt don’t improve the property. 3. Check for and address infestation. Hey, it’s the great outdoors, there are gonna be bugs. But a yellow jacket nest under the stairs? I was stung twice. Justin stopped by and we told him about it. He gave my husband spray poison and suggested we spray at night “otherwise they’ll just get mad.” Is it me or is that something a host should take care of? 4. Outhouse. The outhouse was convenient and clean. It wasn’t too stinky and had few flies. Perhaps that was the result of the cedar chips which get tossed into the hole after each use. Our supply of cedar chips should have been replenished before our stay. Unfortunately, the deposits of previous guests piled up scarily high. Also, a step stool is needed. The seat was high enough to leave my feet dangling. It was downright difficult for our 8-year old to climb up there. Believe me, it’s not a place you want to lose your footing. 5. Fix the mosquito netting. One evening, I spent 20 minutes attempting to mend/secure the ragged netting in the doorway so we wouldn’t continue to be a mosquito buffet at night. 6. Provide a fan. True, the week we stayed featured some unseasonably warm weather but IT CAN BE REALLY HOT IN THAT YURT. Even a small, battery-operated fan would have done wonders for comfort. When camping in the rough, we anticipate a certain degree of discomfort, and understand that it is up to us to make our environment comfortable. But, when paying this much, (extra for me – Justin did waive the additional fee for our son), it is not unreasonable to expect a bit more attention to these issues. To end on a positive note, “Mo” and her crew at The Stow Corner Store were amazing, exactly as advertised – good food, better folks. Exactly as described/pictured, Justin's yurt was the perfect getaway. I'd definitely recommend it! Wonderful way to unplug from technology! We loved staying here! Watching the stars while falling asleep was incredible. The only issue my husband and I had was we couldn't find the swimming hole. But I spoke with Justin the next day and he explained right were it was. And was going to make sure that he put maps inside. That way it wouldn't be a problem for anyone else. It felt peaceful to not have any cell service. AJ and myself spent time playing games and walking on a nearby trail. For dinner we went a few miles back down the road. To the little store Justin mentions in his directions. And let me just say they are the friendliest people we met on our invite vacation. We had dinner there and it was so yummy. The owner even have us extra foil that way we could heat up our leftovers on the grill that is at the yurt. We are already planning on going back next year. I think in the fall the area would be gorgeous. It was a little hot in the yurt when we first got there. Which given that we went in July, was expected. But as soon as we opened the windows and door it quickly became more comfortable. There even was a small fan for us to use. My WIFE and I LOVED THE SPACE. THE NATURE WAS EXACTLY WHAT WE NEEDED TO REFRESH OUR SENSES. Justin is an EXTRAORDINARY LAND GUARDIAN. WE plan to truly make this a HOME AWAY FROM HOME. SEE YOU AGAIN SOON!!! Awesome getaway in the forest down a very long gravel road. Sauna next door and campfire outside. Great stay for an evening before hiking in the Whites. Justin was very friendly and answered all questions very timely. Very peaceful yurt experience. Please read all steps before departing. Separate steps for winter travel below. Print or screen shot these directions. There is not consistent phone service or GPS. Which means I might not get your call. There is a locked forest service. My property is past it. Gate has code 1229. Keep gate shut at all times. Stay on 113B until it comes to a junction with the church about 2 miles. Please go super slow. People walk these roads and have dogs. Go straight onto toad hill road, keep the church on your left and the townhouse on the right. It's a well fairly well maintained dirt road. I drive my ford focus up all the time. After about one mile. (see winter directions if needed) At the fork go right, there is a house in the middle of the fork and it looks like it could be a driveway, it is the road. If you go over the wood bridge that is the wrong way.. The sign says road not maintained and logging operation. The road should be fine for normal cars and is maintained privately. After half a mile you will come to forest service gate. It says no cars but my guests have permission to pass. Continue to the red barn at the top of the hill. Turn left down the dirt road. The tipi will be on your left just down the road. Take a left at the tipi and follow the road to the yurt. leave the same way you came in. Speed limit is 10 mph max. People hike these roads often. Do not drive in if there is snow on the road, you might get stuck. Park at the bottom of the hill before the house in the fork. Do not block the road and pull into the plowed area on the left before the fork and next to a telephone pole. Ski or walk up the road on the right, about 30 minutes. Yes it looks like it could be driveway but is not. Take a left down the road at the barn and the tipi will be on the left. Keep tipi on your right and you'll find the yurt.